Hills prescription r/d feline diet is for the nutritional management of Obese or Overweight cats. It is important to feed a restricted amount of top quality food to cats which need to lose weight. Hills r/d will help as part of the weight control programme. It contains restricted calorie levels and additional fibre, yet is still highly palatable. Being overweight can cause your cat discomfort, reduce energy levels and even shorten her life. Just as in people, weight gain is usually associated with excessive calorie and fat intake combined with a lack of exercise. Obesity can lead to such serious conditions as diabetes, heart disease, and others. These ranges are a starting point only, because cats' needs vary. Adjust the feeding amount as necessary. To correct obesity, the amount to be fed should be based on the estimated ideal weight (target weight) and not the weight when obese. Fat Low Stored body fat is used to meet energy needs, resulting in weight loss. L-Carnitine Supplemented Facilitates conversion of fat to energy, causing faster weight loss. L-Lysine Added L-Lysine Supplemented Helps preserve lean muscle mass. Superior antioxidant formula Added Helps neutralise free radicals that increase in obese animals. Poultry meat meal, maize, maize gluten meal, cellulose, digest, animal fat, minerals, L-lysine, L-carnitine, taurine, vitamins, DL-methionine, trace-elements, beta-carotene. Realistic weight loss is approximately 1 % of bodyweight per week. The feeding amounts shown may sometimes need to be decreased to produce optimal weight loss. Full client co-operation must be obtained and food intake strictly controlled. Hill's provides client information to help successful weight loss; contact your Hill's representative for assistance. 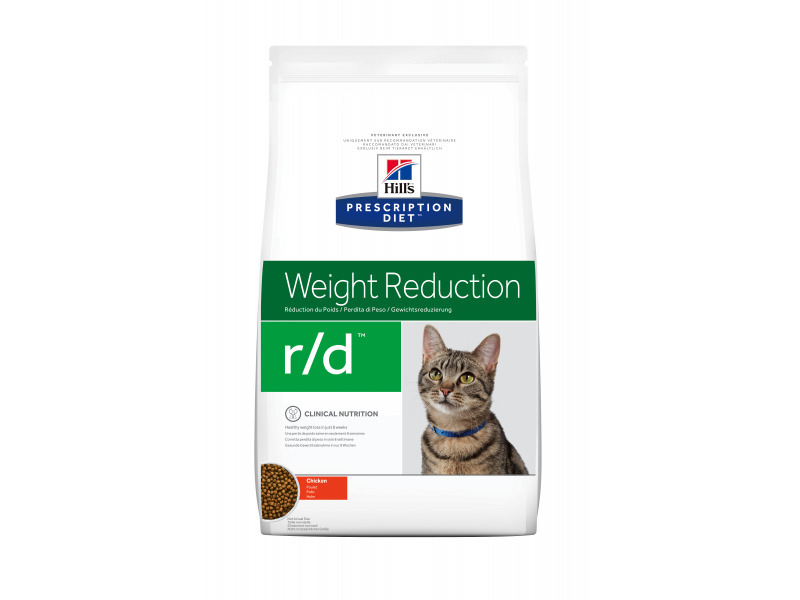 After reaching the target body weight, a cat should be fed Prescription Diet™ Feline w/d™ to maintain its ideal weight. Do not allow obese cats to fast for more than 2-3 days because of the increased risk of hepatic lipidosis. Do not give urinary acidifiers. Cats that are debilitated or underweight, dehydrated, or with increased energy requirements. 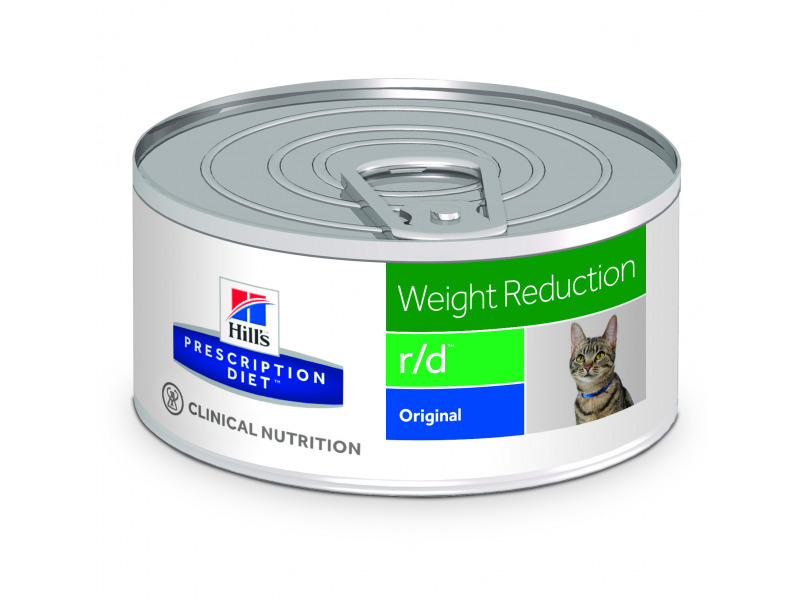 There are currently no questions for Hill's Prescription Diet r/d Weight Reduction Cat Food - be the first to ask one!